LEXINGTON, Ky. (July 22, 2014) — Students, faculty, administrators and staff in the University of Kentucky College of Education have been hard at work this summer, making progress on a number of programs and initiatives that are innovating P-12 learning, leadership and assessment in Kentucky schools. "The College of Education’s faculty, staff, students and collaborators feel as committed and responsible for the success of P-12 students as we do our own students," said Mary John O'Hair, dean of the college. "We take to heart the concept of 'a seamless P-20 education system,' and these programs represent this strong commitment to the students in the Commonwealth." The college continues to progress in its Next Generation Leadership program, derived from the college’s Kentucky P20 Innovation Lab. This program was designed in response to a nationwide need to redesign school systems to meet the needs of today’s learners. The effort has opened new doors for university collaboration with Kentucky's schools by connecting college research faculty with pre-school through graduate-level education practitioners across Kentucky and beyond. Most recently, the college completed its first cohort of the Next Generation Teacher Leader academy, with nearly 100 teachers from 17 school districts in eastern Kentucky. The program supplements the already-established Next Generation Leadership Academy, which supports hundreds of principals and district level staff. The addition was made possible after the U.S. Department of Education awarded $30 million to the Kentucky Valley Educational Cooperative (KVEC) earlier this year to implement a plan involving a strong collaboration with the college and school districts. The grant, which is part of "Race to the Top District" funding, supports participation in the college's leadership academies each year over the course of the next four years. "Our goal in partnering with school and district leaders is to assist them in designing new systems to support higher levels of learning," said Linda France, director of the Next Generation Leadership Academy. "We're seeing many promising practices emerge that are resulting in students being more engaged in their learning and improvement in overall achievement." The academies are yearlong professional learning endeavors focused on the critical attributes of Next Generation Learning, developed by the Council of Chief State School Officers (CCSSO). The attributes guide the work of the academies as a set of design principles for systematic change. "We have outstanding district and school leaders in Kentucky who join UK's Next Generation Leadership Academy because they understand the need for change but they support in taking intentional steps in creating personalized teaching and learning environments," said Carmen Coleman, associate professor in the Educational Leadership Department and former superintendent of Danville Independent Schools. "We are working toward common goals of preparing students to reach unprecedented goals and the work is inspiring and sometimes scary but the rewards far outweigh the struggles." Buddy Berry, superintendent of Eminence Independent Schools in Henry County, Ky., shares how the Next Generation Leadership Academy, housed in the UK College of Education's Kentucky P-20 Innovation Lab, has impacted his district. Video by UK Public Relations and Marketing. To view captions for this video, push play and click on the CC icon in the bottom right hand corner of the screen. If using a mobile device, click on the "thought bubble" in the same area. The college also hosted a special summer institute for educators last month called "Getting Standards-Based Grading Right: Honest and Accurate Grades for ALL Students." This initiative featured some of the college's leading experts, including Thomas Guskey, professor of educational psychology, Gerry Swan, assistant dean and associate professor of curriculum and instruction, and Lee Ann Jung, associate professor of special education. Participants learned how to develop new standards-based grading and reporting policies linked to the Common Core through a variety of presentations, case studies, discussions and reflection activities. Participants also discovered a variety of new ways to report student learning in standards-based learning environments, how to make appropriate adaptations for exceptional learners and English language-learning students, and strategies for involving students and parents in the reporting process. The College of Education's Department of STEM Education also held its popular See Blue STEM Camp last month, which gave rising 5th-8th graders in Kentucky the opportunity participate in a week-long camp of hands-on projects in the fields of science, technology, engineering and mathematics. In partnership with the College of Engineering, the camp offered 144 students a peek into the world of STEM, offering real-world applications that demonstrated what careers in the STEM fields might entail. 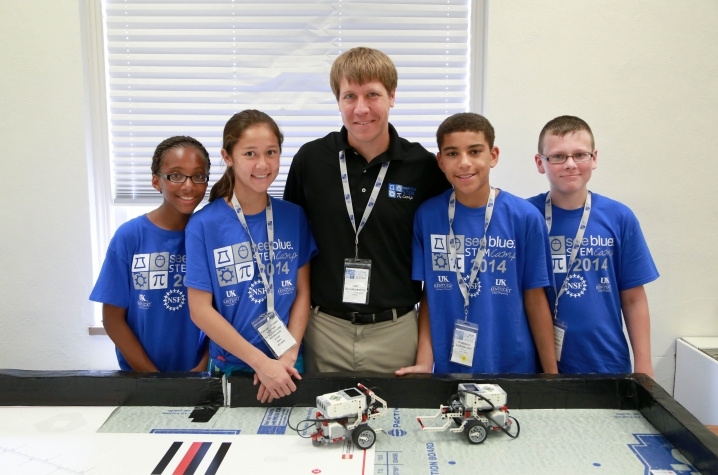 Led by Margaret Mohr-Schroeder, associate professor of STEM Education, and College of Engineering professor Bruce Walcott, the camp also gave many UK students volunteers valuable teaching experience, mentorship from faculty, and the opportunity to witness the powerful impact of the camp's unique teaching approach. The camp was originally supposed to take place over the course of two weeks: the first week for fifth and sixth graders, and the second week for seventh and eighth graders. But due to snow days impacting school districts' schedules, all of the students had to attend the same week. Mohr-Schroeder, who blogged about the camp throughout the week, said this change impacted everyone for the better. "Since we were going to one week with 144 students, we knew we needed to have more help," she said. "It was an obvious choice to offer the opportunity to the preservice (future teachers) middle and secondary mathematics and science students in our college. Through this unique experience, they got to work with the students in a smaller, low-stakes setting that allowed them to really practice their classroom management skills, their questioning techniques, and work on developing appropriate relationships with students. They were mentored through this process by the high quality inservice teachers as well as the college faculty we had involved. Although they were exhausted by the end of the week, they all stated this was one of the best learning experience they have had thus far and really enjoyed the opportunity to grow as future educators and felt they gained a lot of STEM content knowledge alongside the students as well." 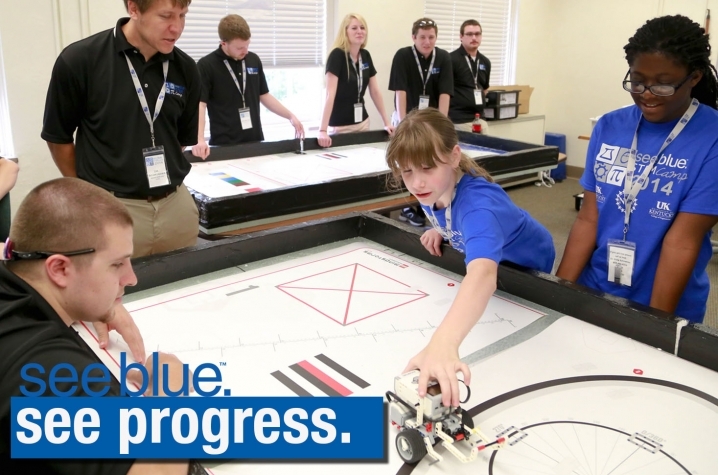 Video featuring the 2012 See Blue STEM camp, courtesy of InnovateKY. 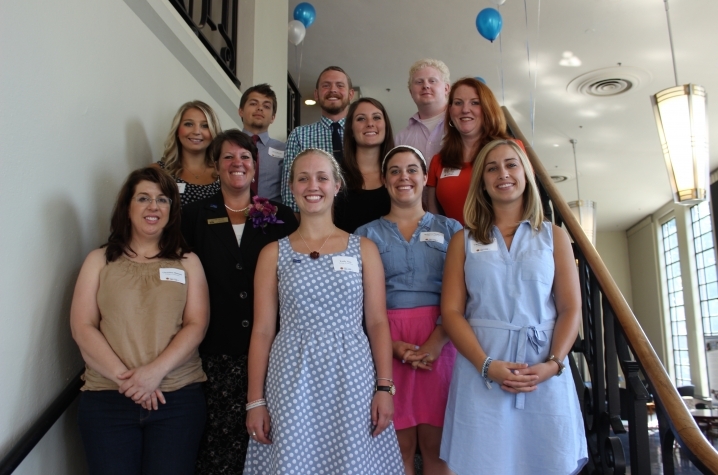 The College of Education also played a significant part in UK's first GEAR UP Kentucky Summer Academy@UK, which took place June 22 through July 11. In partnership with the Council on Postsecondary Education and the UK Division of Undergraduate Education, this college and career readiness initiative brought nearly 85 high school sophomores to the UK campus to live and learn. By showcasing the skills and attitudes needed to succeed at the state's premier research university, the GEAR UP program aimed to develop a college transition path to UK for the students. The students attending program were recommended and supported by their principals, teachers and guidance counselors for having strong potential to succeed in college with the necessary preparation. Laurie Henry, associate professor of literacy and director of the College Readiness P20 Innovation Lab, managed the high school students' daily schedules that reflected a typical UK student's schedule. Many College of Education students also served as teaching assistants for the high school students and worked extensively with the management of the three-week program.